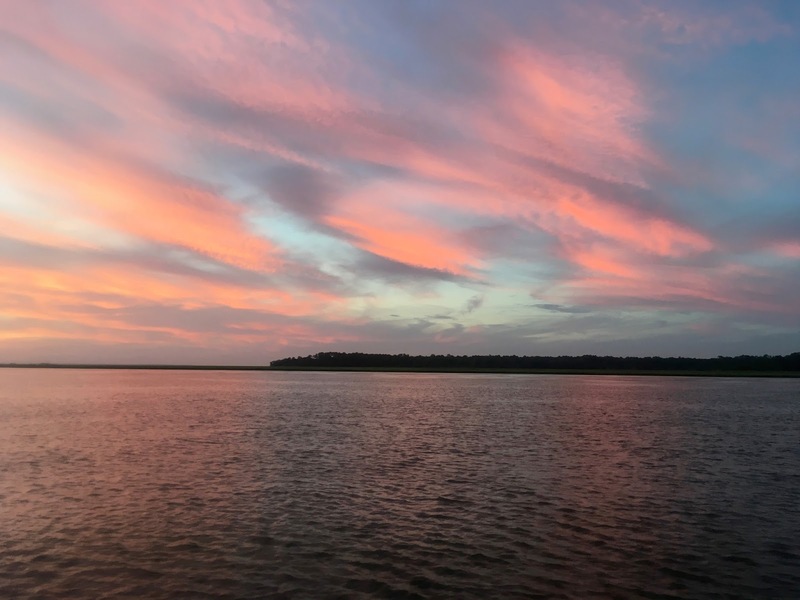 Well, it took longer than we thought to make the relatively short sail from south Cumberland Island, up the ICW to the next island up the coast, Jekyll Island. What we didn't factor in was tropical storm Emily popping up off the west coast of Florida. The storm hardly touched the protected ICW, but the same couldn't be said for the inlet we had to cross. The pilots all warned against attempting a crossing except in unsettled weather, but we stuck our nose out anyway, just to see what it looked like. A 50-foot ketch was about a mile ahead of us, and watching her nearly pitch her masts out was enough for me. We beat a hasty retreat to the Brickhill River and spent two nights in a beautiful and peaceful anchorage, watching Emily's lightning show from a safe distance. That gave me some time to edit a short video we had made while bringing our ten-foot Porta Bote back aboard Petronella for the first time. I had been a little nervous about this maneuver, since the boat seemed much larger than the inflatable that had come with Petronella. This ancient eight-foot inflatable had given up the ghost as soon as we had landed on American soil, and we'd bought the Porta Bote as a replacement, for a number of reasons. First, I didn't like the enormous amount of deck space the inflatable took up. John and Gill had partially deflated it when sailing, but I didn't like that because the drooping tubes obstructed the jack lines and made it more difficult to move forward with a clipped-on harness. Sailing with the inflatable still inflated was a bit better, but it still took up a lot of space, and obstructed the view forward. Second, I don't like having a dingy that can't be rowed easily. They are inherently less safe, IMHO; but they are also inconvenient: sometimes it's just easier to row than go through the rigamarole of dealing with an outboard. Third, inflatables are fragile, short-lived creatures. John and Gill managed to nurse theirs along for many years, but most people seem to just replace them every few years. Anyway, we went with the Porta Bote, and launched it for the first time on Cumberland Island. It was easy to put together on deck, and to launch (just tip it over the side), but recovery seemed a bit more difficult. A couple of guys could have man-handled it up and over the guard rails, but I didn't want to put Helena through that, so looked for a no-muss, no-fuss single-handed method. And came up with one! Check out the video below for details. Just finished reading Chapter 21 of An Unlikely Voyage, and about to read of your trials and tribulations on the NJ ICW. Plan to make the reverse trip from Cape Cod south in 2019, but should have done so when I retired ten years ago! Why 2019? Carpe diem! Definitely worth doing once. Preferably in a trawler! Circumstances allowing, I at least browse through your output. By all means, please continue.